Our DNA’s four-letter alphabet spells out the genes that determine the traits of human beings in all their complexity. How those four letters line up six billion times to build our personal genome holds the clues to how we get sick and how we respond to treatment, giving us hope that one day we can prevent or slow disease. The Hope for Life® sculpture embodies the Stowers Institute for Medical Research’s desire to improve human health through basic research by expanding our understanding of the genes and proteins that guide the function and behavior of all living organisms and the individual cells within. The sculpture was created by Larry Young and fabricated in Kansas City by the A. Zahner Company. 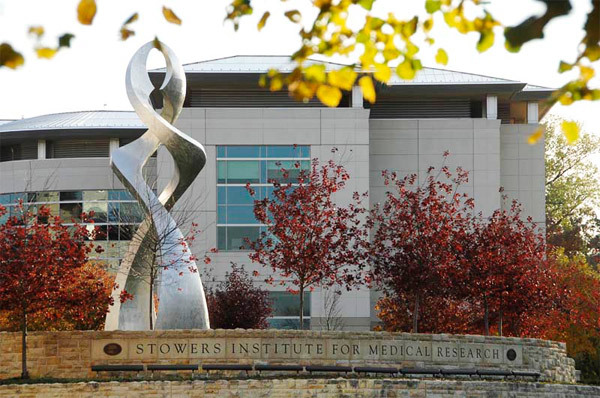 Working from his studio in central Missouri, sculptor Larry Young created the original Hope for Life® sculpture to symbolize the essence of the Stowers Institute. “The image of the human form majestically suspended in space between two spiraling life forms makes a powerful statement of mankind’s hope for life,” says Young. With sculptures placed throughout the country and abroad, Young is recognized as a world-class artist whose sculptures are considered the three-dimensional equivalent to the symphonic in music. His world-class status as an artist is matched by his world-class status as an athlete. Young is the only American to ever win an Olympic medal in long-distance walking having taken the bronze in the 50-Kilometer Walk in the 1968 and 1972 Games.